Producers: Radiohead and Nigel Godrich. Quick Summary: From day one, every critic loved OK Computer. The reviews praised it as the best, and most original rock album to be released for years and it shot straight in at #1 in the UK album charts. Radiohead headed off on another extensive touring period. But the pressure of their new status as award winning geniuses of rock music began to take its tole. Suddenly, this band who had been ignored, was all over every magazine cover, in every interview, top of every poll, and in every award list. Documented in the Meeting People Is Easy video, Radiohead became very paranoid, and burned out by the amount of fame that suddenly hit them. And decided after the OK Computer tours, to take a long break away from it all. The Bends was, and remains a brilliant album. Radiohead proved to a world that didn't want to believe them, that they could make great music. And great music they made. So what exactly do you do now? Surely they couldn't create a third album that was better than their last? Don't be silly! Haha....... They did. 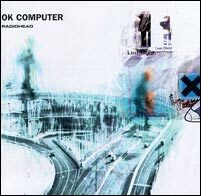 From the earliest of stages, OK Computer was being praised left, right and centre as an astounding CD. Amazingly original, yet beautiful tracks graced the album and every writer worth his pen and paper was writing about just how great it was. It shot straight to #1 in the UK album charts. And Radiohead went from being a band that were ignored by the public, and rejected by the media, to the most hyped over rock band in the world. They went again, on a very long promotional tour. Playing all their songs to sell-out crowds all over the world. Being followed everywhere by journalists and interviewers. Radiohead was suddenly popular. People wanted to hear about them. They were even winning awards and polls all over the place. But the band aren't the type to bask in fame. As the video Meeting People Is Easy documented, the endless amount of interviews, and media interference took a huge toll on the band. They started to become very weary towards the end of their touring schedule. And decided when the tour was finished, they were going to take a very long break from it all. They disappeared from all forms of media limelight completely for 3 whole years. OK Computer is the best album in the world, in my opinion. It isn't just an add on to The Bends. It says something different altogether. But at the same time, the great Radiohead sound discovered with the previous album has not been lost, only improved for this one. Throughout the album, in both lyrics and music, the message remains one of anger and fear towards the outside world. Towards the system and all its people. OK Computer is very much about the things which are out of our control. The things we can't stop no matter how much we want to. The way life is becoming an act in a pre-defined play, rather than actual life itself. No song on the album describes this feeling better than Fitter Happier. Each song is amazing in its own right, with a unique mood and sound. But the order in which they are placed is absolute perfection. The sound, rather than being abrupt gear changes between song, is a flow of constant music from track to track. I don't mean each track integrates seamlessly with the next. But, that each track doesn't change the feeling of the previous. It's like each one is a continuation of the last. The previous two albums were heavy on the guitars. OK Computer is less so... As the guitars were bashed and thrashed in Pablo Honey, they were played with skill in The Bends. Now they are being used in a different way. A more subtle way. OK Computer is still a prominently guitar driven album, but it's much less noticeable. There are many more sounds to listen to. The way it plays is not stereotypical of guitar bands. Basically what we have here, is an album that dared to be different. An album that did so brilliantly. Kicking every 'one-hit wonder' critic firmly in the teeth, and putting Radiohead on a par with The Beatles as the most original, and greatest music creators of their generation.